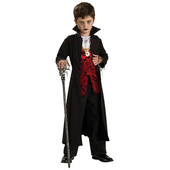 Vamp Student Boy Costume includes soft faux velour trousers with elasticated waist, a matching blazer with purple collar and buttons and yellow trimmed pockets, one with ' Vampire ' logo. 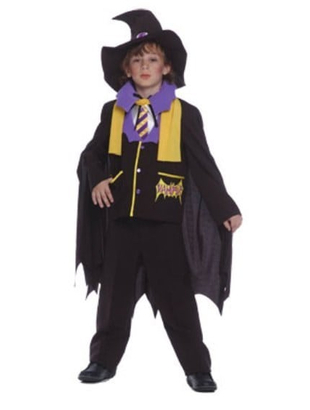 Also includes crisp white shirt front with attached purple and yellow tie, yellow sash, hat with buckle and a black cape with a high purple collar. Please note sizes on package differ.